Attic Insulation – Do You Have Enough? Proper attic insulation can make a drastic impact on your utility bills. Any home over 5 years old should have the attic insulation evaluated as settling insulation and higher summer temperatures can degrade its ability to protect your home from the summer heat. 7 reasons to be concerned about the condition of your attic insulation. Its been more than 5 years since the house was built. You have lived in the house for more than 10 years and never evaluated it. Some thermal insulation materials settle more than others. Increasing summer temperatures require more insulation. Recent contractor activity in the attic (i.e. telephone, CATV, Security, HVAC). These workers can matt down the insulation while performing their job. Rodent infiltration. These buggers will easily pack down the insulation to get to various points of interest. Acceptable attic insulation 10 years ago is not the same as it is today. In fact, in just 3 years, my region has been increased from an acceptable value of R31 to R38. Determine how much insulation is required. Use this Insulation Chart to determine how much is enough. Enter the attic with great care. Attic entrances may be through a door or attic stair case or possibly a hatch in the closet. WARNING: You must keep your feet/body on the wood joists (beams) as stepping on the sheet rock will cause damage, and possibly cause you to fall through the ceiling. With a flashlight and yard stick: Randomly check the depth of the material. Ensure the measuring device (yard stick) touches the sheet rock and measure to top edge of the insulation material. Try not to crush the insulation while performing the inspection. Determine the type of insulation. Different material have different R values. If you can see the ceiling joist as in this picture, you probably do not have enough insulation. Typical ceiling joists can range from 2 X4’s, 2X6’s to 2X10’s. For instances, if you have 2X6 beams with loose fill rock wool, you would have a R value of 16.5 (3.0X5.5″=16.5). Newer houses typically have larger beams. Determine the material type as this will help in figuring out how much insulation to add. 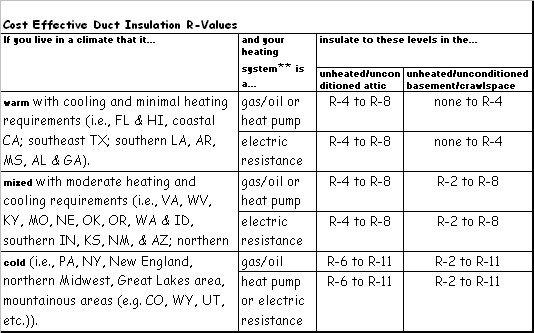 Use the chart below to calculate the R value of the existing insulation. TIP: If you find you have enough insulation in areas that have not been disturbed, but you find areas matted down due to activity or construction work. Use a soft plastic rake to fluff it back up. Fiberglass: Comes in batts, blankets, and loose fill, either pink, white or yellow in color. Fibrous in nature and can leave you with microscopic splinters. TIP: Before working with fiberglass insulation, spread a heavy coat of baby powder over any exposed skin, this will fill your pores briefly while working with the material. Rock Wool (or Mineral Wool):Loose fill used aggressively prior to 1970. Usually brown or dark gray in color. 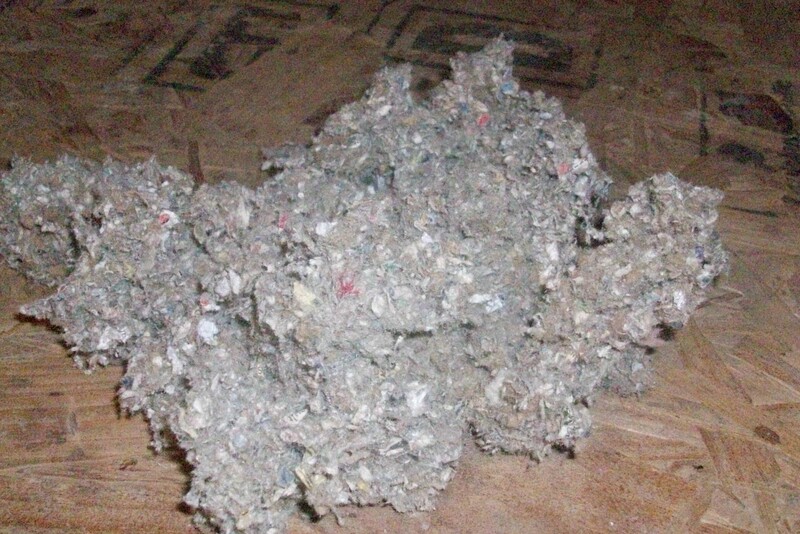 Cellulose:Loose fill made of recycled paper. Blue or gray in color. With close inspection you will find small pieces of newspapers. The product is treated with a fire-retardant solution for safety. Combination:This is not a type, but you may find a combination of two or all three types. Previous owners may have added insulation over the life of the house. This is not a problem, but you should determine how many inches of each type to calculate the value of the existing insulation. By now, you should know, how much insulation you have vs. what you need. Assuming you need to add insulation, HomeownerBOB highly recommends hiring a professional for this task even though the home centers will provide you tools to perform the work. Once you determine what type of new insulation you prefer, you can easily bid shop the work over the phone. The professional will need to know 1) square footage of the house, 2) type of insulation material you would like, 3) how many inches to apply. So how do you determine what type of insulation to use? Read my article on “The Choices“. The US EPA reports leaking ducts reduce overall HVAC efficiency by 20% accounting for a loss of over $140 per year due to these leaks. As mentioned in earlier articles, HVAC ductwork has not received the attention it deserves. Take a look at my HVAC Duct article to evaluate and inspect your existing duct work. If you have determined that it is in need of attention you have three choices, 1) do nothing, 2) have them replaced or 3) re-insulate them. 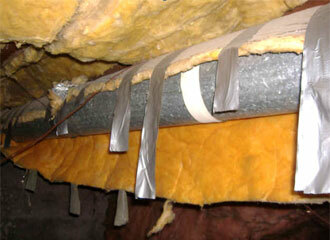 Duct Replacement: Be prepared, HVAC contractors typically want to sell new systems. Here is the SW part of the US, their big season is the summer, having this done during the cooler months may be a better choice. Duct replacement is not as profitable as system replacements, but keeping their technicians busy can be better than not working them at all. Flex ducting is a widely used proven product but does not have the long-term performance rating found with a typical sheet metal product. But is widely used in the residential market and most professionals like to use it because it is easy to install and not as labor intensive as rigid duct work. This product can easily be mis-installed by creating kinks and sharp bends that can reduce the product performance. Read this flexible duct inspection method before you meet with the contractor to better understand the product and how it is applied. After an evaluation, most HVAC specialists will want to replace the ducting in lieu of repairing or re-insulating. Why? It’s quicker, cheaper and it becomes a known value. This is not a bad thing, these folks are trying to make a living and attacking the problem by replacing everything may be an economical solution for both of you. If you allow a professional to replace the ducts, make sure to ask some of these questions. Will all the joints and edges be sealed with (paint on) mastic? What is the R value of the new duct? What is the life expectancy of the duct product? What is the product warranty? What preventative measures are followed to avoid kinking (of the ducts). Will the system be tested for leaks after completion? If the professional didnt mention it, also consider having all the output and return registers (this is the box in the wall/ceiling where the vent cover is attached) replaced or re-insulated. Most new registers are sealed and insulated to insure a tight fit. Also, ask them to use spray foam insulation between the register protrusion and the sheet rock, this will further seal the interior from the attic space. Most HVAC professionals do not address register penetration into the interior space. If you have any rooms that never seem to adequately heat or cool, make sure and mention this to the professional too as he may have to resize or reroute the new duct work to better balance the system. Duct Re-insulation (for rigid ductwork): This is a great DIY project if you consider yourself cheap labor and you dont mind working in the attic. Consider this a mult-weekend project. Before you start, ask yourself these questions. Does your system work reasonably well? If you have any rooms or areas in the house that never properly heat or cool, consider adding an additional output duct as this would be the time to address it. Consider using a professional to perform this work as you may need to rebuild some of the system to retain the system balance. Is your attic adequately insulated? If not, plan to do it, but after all you other attic work is complete. The process if fairly straight forward and here is an outline of the necessary work. Take adequate precautions while working in the attic. Avoid stepping directly on the sheet rock ceiling and wear protective clothing and dust masks. A friend of mine was looking to buy a house recently, he asked me to come by and check it out. It was apparent the owners of the house were fairly interested in reducing their electric bill. Most all of the light fixtures were using CFL’s, they were using a set back thermostat and they had recently replaced an exterior door with one that was Energy Star rated. But what really shocked me was my trip to the attic. Three things, 1) they had sprayed radiant barrier paint on the roof decking but 2) there was less than 3 inches of insulation in the attic and 3) the air conditioning ducts lacked adequate insulation requiring the HVAC unit to work extra hard to provide the conditioned air throughout the house. I’m not knocking the radiant barrier (I’m a believer), but even most of the radiant barrier folks will tell you to increase you attic insulation first. There are good reasons why HVAC installers sometimes throw in insulation or RB as part of their package… it works and it also reduces the strain on the HVAC. Blown in insulation is cheap and it can be added in a mater of hours. Attic Insulation is best applied as blown in loose fill when you need to add more to an existing home. The product will reach into every nook and cranny, is easy to apply (with the proper equipment), and has instant results. The best way to determine the amount of insulation needed is to refer to this US. DOE site as it will provide the recommended R-Value down to the zip code. What is the difference between the attic insulation products and why is one better than the other? If you spend any time looking at the comparisons of the products you will find advantages and disadvantages in all the of them. Its very easy to get caught up in the data, in fact some make a point in overpowering the consumer with too much data. The following chart reflects the most popular products and comparable characteristics that most consumers can understand and recognize value in them. This comparison is for blown-in type insulation only, and these products are typically the most popular. 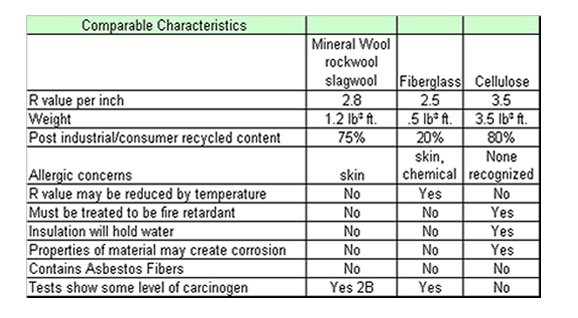 Rockwool: Rockwool insulation has been classified by the US Gov. as a class 2B carcinogen with “possible” evidence but lacked conclusive results to be considered a “probable” contributor as a cancer causing agent in lab rats. Additionally, chards of the material will cause skin irritation much like fiberglass. It was very popular prior to 1970 and with some limited concern is still used as an insulation product. Fiberglass: Fiberglass insulation has been shown to reduce its effectiveness during both high and low temperature ranges (due to convection heat loss), potentially reducing its effectiveness by up to 50%. Even though fiberglass chards can easily irritate the skin, once installed, little risk to the homeowner has been proven. However, the US Gov. has recognized fiberglass as a carcinogen, the levels have been shown to be too low to impact the homeowner. Cellulose: Cellulose has become recently popular due to being composed of recycled paper products. Cellulose is heavy compared to the other two and the added weight in the attic may cause standard 1/2″ sheet rock to sag or droop when applied to ceilings with joists spaced at 24″ centers. Additionally, since Cellulose will retain water, moistened by a roof leak may cause the sheetrock to prematurely fail. Even though the product is treated with chemical flame retardant (generally with a lifetime guarantee), additional care should be exercised by providing adequate space around recessed light fixtures, chimney flues, water heater and HVAC vents. The blown-in insulation business is fairly competitive and you may find (as I did) that hiring a professional is about as cheap as doing it your self. HomeownerBOB recommends the professional route. The difference in the choices are fairly close, cost may be the most important factor, on the other hand it might be the environmental impact. Either way, make the decision, you will be happy with the results.